The last time I was at my local library (give it up for the Multnomah County system, what what!) 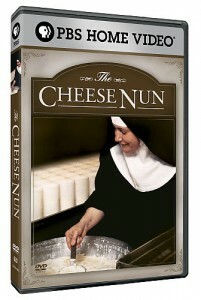 I saw a copy of “The Cheese Nun” DVD. Of course, like a complete cheese nerd, I snatched it up! It’s a PBS documentary about a Benedictine nun, Sister Noella Marcellino, who goes in search of a deeper understanding of just what is happening to cheeses as they go through the ripening process. She ends up returning to college to conduct scientific research into the microbiology of cheese fermentation. She continues on in her studies to the cheese caves of France and the artisanal cheesemakers there who have been practicing their craft for hundreds of years. The nuns of her Abbey are absolutely charming, working their land, milking their cows and making cheeses. The science behind the cheese fermentation process was fascinating and not something which I think I had even slightly grasped before. And the visuals of the cheesemaking process were really informative. If you’re at all interested in the history of cheesemaking and seeing how it’s done (in a variety of ways) then totally check out this DVD. My husband and I joined an amateur bowling league last fall and had a great time with our team. 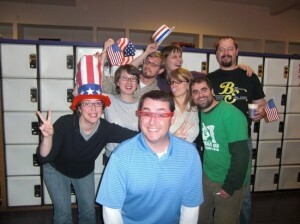 (We are quite amateur, we’re like “Bad News Bears” — that’s us up there on election night at the bowling alley.) Anyway, one of the couples in our team let on that they had a raclette grill and so Thom and I instantly put forth the idea that they should host a raclette night. Thankfully, Marc and Kristen were happy to do that and so, after a long, harrowing bowling season which resulted in a shut-out by our team in the finals (the agony of defeat), we were ready to drown our sorrows with stinky, melted cheese. I feel like there’s two kind of people in this world: people that don’t know about raclette and people that love raclette. As a kid and a military brat, I grew up moving around and living in a lot of different places. When I was very young we lived in Germany and my parents were really great about picking up the local food culture and adopting it as their own. I can only imagine that that is where my mom picked up the raclette habit. As a kid, I wasn’t a big fan of it. As I got older, though, and my tastebuds matured, I started to really enjoy it! Raclette is a semi-soft, cow’s milk cheese that has a very distinctive odor. The cheese hails from the french-speaking part of Switzerland and is made primarily in the Valais Canton. It is served hot over a selection of vegetables, typically boiled new potatoes, pickled onions and small gherkins or cornichons — little pickles. It can also be served alongside or over bread. 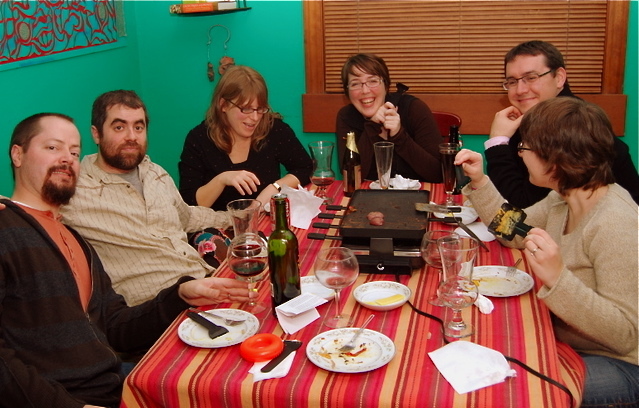 A few years ago, one of Thom’s coworkers was talking about raclette and Thom joined in (having had it at my parents’ house a couple times) and pretty soon the coworker was hosting a raclette night with her raclette grill. If you mention you have a raclette grill, we will force you to feed us stinky cheese! Anyway, here’s the spread that Kristen and Marc put together for us in their lovely home: sliced raclette (of course) and also sliced gruyere and gouda. The grill is a two part contraption — the top part heats up and you can put veggies and meats there to cook. Kristen marinated some fresh shrimp in olive oil and spices and cooked that on top with sliced red and yellow bell peppers. The shrimp was phenomenal! For smothering with raclette, they did the traditional boiled potatoes, gherkins and pickled onions. You can buy small white pickled onions in a jar or, if you are feeling special, you can do what Kristen did and pickle your own onions. They were out of this world — sweet and vinegary — and I could have eaten the whole pile just by itself! They also had on hand sliced baguette, marinated mushrooms, green olives and sliced apple. It was, hands-down, the fanciest raclette I have ever seen let alone eaten. But, what about the cheese? There is a slot underneath the grill top where little paddles sit. You put your cheese on the paddle and slide it back in. Keep an eye on the cheese and when it gets bubbly, take our your paddle and use your handy raclette scraper(!) to push the cheese over the condiments already arranged on your plate. Get your fork out and dig in as it’s best hot. The flavor of the cheese is mild and the cheese releases a bit of oil as it cooks so it’s quite creamy and blends with the flavors of the other foods. Something about the vinegar both balances the cheese flavor and enhances it. I may be tempted to get my own raclette grill as we had such a good time. If you are interested in trying this and you don’t have to have a raclette grill, it’s no problem! While my mom has a number of wonderful, specialty gadgets in her kitchen, she does not have a raclette grill and she has made it for our family for years. She uses an oven-proof plate — a shallow dish or a cast iron skillet — slices up the raclette thinly and puts it in a 450 oven until bubbly. Then the hot dish is carefully set in the center of the table and everyone cuts a slice and uses a spatula to slide the hot cheese over their condiments already on their plates. Delicious! Finally, in preparation for the event, Marc sent out a few emails about what raclette is and how it is served. He came across this amazing video which shows raclette being prepared in a way I’ve never seen before but I’m very excited to try someday. Thom and I are talking about a Europe trip and this will definitely go on the agenda. If you haven’t quite got your mind wrapped around this, read this charming writeup from The Amateur Gormet where the author gets schooled on raclette by his young, Swiss nephew — lots of great raclette photos. 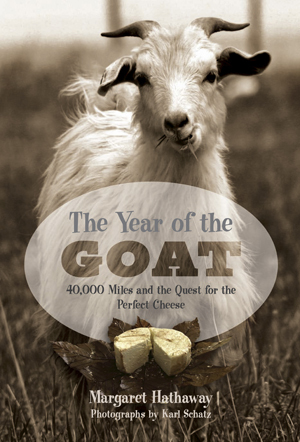 I’ve started lining up some cheese related books to read over the holidays and even though I was in the middle of Franzen’s memoir I couldn’t resist taking a peek at the first chapter of Year of the Goat: 40,000 Miles and the Quest for the Perfect Cheese by Margaret Hathaway and got hooked — I had to read it right to the end! It’s a quick read covering the travels of two New Yorkers — the author and her fiance — as they cross the U.S. exploring the entire goat world in a quest to discover if they could run their own goat farm. They visit livestock auctions and explore the largely ethnic world of goat meat. They visit goat dairy farms and cheesemaking operations and see a few goat shows where the fanciest and most lovingly cared for goats get to strut their stuff with their owners. The book is full of history and anecdotes about these curious animals and also touches on the current state of small farms and agriculture in the U.S. Totally recommended reading and you can also check out their website where they blog occasionally about life on the farm and if you dip way into their archives you can read blog posts and see photos from the places they visited and the people they met. I recently was turned on to David Fankhauser’s excellent cheese page. Mr. Fankhauser is a professor of Biology and Chemistry at the University of Cincinatti Clermont College. He has really dug into the science of cheesemaking and created a great resource for home cheesemakers. Check it out! This article from a couple years ago talks about how effective it can be to pair beer with food. The writer interviews Brooklyn Brewery brewmaster Garrett Oliver who talks about pairing beer with some foods which may be difficult to pair with wine. He raises the interesting point that beer can really break up the food and act as a palate cleanser in a way that some wines cannot. Here at FUCheese we are beer lovers as well so learning how beer might complement our favorite cheeses would be exceptional. For our third cheesemaking project we are planning to focus on goat milk and I’m going to try to put together a beer and cheese pairing. I will report the results! We learned in our first project — 30-minute mozzarella — that we have lots of leftover whey to deal with after making the cheese. So, for our second cheesemaking endeavor we decided to explore the wide, wonderful world of whey. We decided that we would each make a batch of the 30-minute mozzarella and with the leftover whey we would make bread, a double batch of ricotta and also make some refreshing, summer, whey drinks. Everyone got a gallon of Organic Valley whole milk from New Seasons in Sellwood. Something interesting: I called ahead of time to ask about getting whole milk that was not ultra-pasteurized. All milk comes from the grocery store pasteurized (145F for 30 min or 161F for 15 seconds) however, the higher heat involved in the ultra-pasteurization ensures an even longer shelf life. This milk is heated to 191F for at least 1 second which destroys all the organisms in the milk as well as damages the protein structure and kills the natural enzymes present in milk. It’s not the best base for making cheese at all. In any case, I spoke to a nice man on the phone who assured me that their half-gallons of Organic Valley were just plain old pasteurized. However, when I got there, all the milk was labeled as pasteurized with no inidication of which might be ultra-pasteurized. I flagged down someone who brought me the man I spoke with on the phone. His feeling was that the gallon size was bottled at a different plant and that some people (perhaps fellow cheesemakers) bought the larger size and were not happy with it. However, no one had complained about the half-gallon size so he could recommend it without reservation. This ends up being a little over $5 for a gallon but at least we knew it was the good stuff. Nicole also made an experimental batch of mozz with a gallon of whole milk which she purchased at the farmer’s market from Noris Dairy. The milk from there was quite delicious though perhaps not so delicious that one should go out of their way to use it to make the 30-minute mozz. More on Noris Dairy at a later date. Our first cheesemaking project was Ricki Carroll’s “30-minute Mozzarella” recipe. So, we decided to re-create that since we had plenty of leftover rennet and citric acid. These batches would become the base of the ricotta. The recipe is incredibly simple to make and the result is a very light cheese which, when we first made it, we ate in slabs on fresh bread sprinkled with salt and pepper. Very delicious. In her book, Carroll notes that this mozz should be eaten immediately. I have to agree. We all kept our new batches, balled up in slightly briney fresh water but I felt like it got too gooey and strange later to eat. I did use it on some salads and it was pretty good. I’ll let Jen or Nicole tell you how they reused theirs. So, we did five batches(!) and had gallons and gallons of leftover whey! It’s good that I had an extra stockpot around! Somewhere in the back of my mind, I was afraid that we wouldn’t have enough whey for the ricotta recipe. Let it be noted that that is ridiculous. Gallon of milk = gallon of whey (just about). I’m going to break this up into two posts….